CAUT, which represents close to 70,000 academic professionals in Canada, passed a resolution in December asking Canadian universities and colleges with Confucius Institutes (CIs) to shut down the institute on their campuses, and those in negotiations to get an institute to cease doing so. “Confucius Institutes are essentially political arms of the Chinese government,” CAUT executive director James Turk said in a statement. The now-former head of Canada’s intelligence agency CSIS has said that CIs are under the control of Chinese embassies and consulates and has linked them with some of the regime’s other efforts to influence Canada’s China policy. Turk said the University of Manitoba rejected having a Confucius Institute because of concerns over political censorship (the university’s official response cited “logistics issues”), and that McMaster University closed its institute after a human rights complaint by an instructor who alleged CI hiring practices discriminate against Falun Gong adherents. Currently, Canadian institutions that host CIs include the University of Regina, University of Waterloo, Brock University, University of Saskatchewan, British Columbia Institute of Technology, University of Sherbrooke/Dawson College, Seneca College, St. Mary’s University, Carleton University, Toronto District School Board, Edmonton Public School Board, New Brunswick Department of Education, and the Coquitlam School District. McMaster closed its Confucius Institute earlier this year due to dissatisfaction with CI hiring practices in China. “Hiring decisions in China were not being done the way we would want to do the hiring,” a university spokesperson said at the time. Epoch Times reported in 2011 that Sonia Zhao, a Chinese woman who came to Canada to work at the McMaster CI, was required to sign a contract promising not to practice the spiritual meditation discipline Falun Gong, also called Falun Dafa. The Chinese Communist Party (CCP) launched a campaign of persecution and defamation against Falun Gong adherents in 1999, which continues today. Falun Gong is a non-political meditation practice rooted in ancient Chinese culture that gained millions of followers across China in the 1990s. The discrimination against Falun Gong by Confucius Institutes is an extension of what is happening on a large scale inside China, where even the education system has been co-opted by the CCP to persecute Falun Gong adherents. Zhao’s family has experienced persecution in China firsthand: her mother was imprisoned more than once for her belief in Falun Gong. 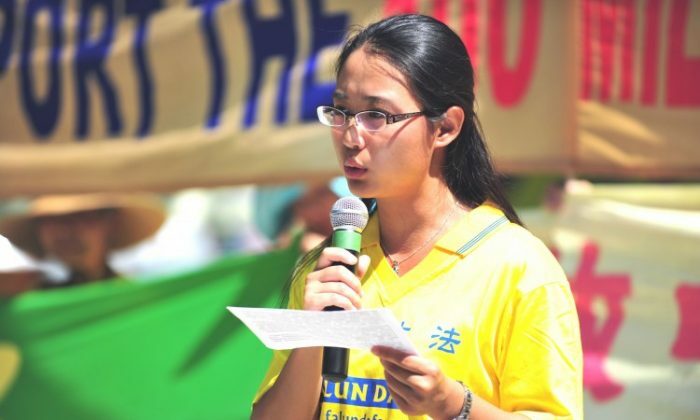 Zhao said she feared she would be punished by the regime if she made it known that she practices Falun Gong. The stipulation that instructors must have “no record of participation in Falun Gong” was also published in English on Hanban’s website, and was available for years. It was eventually taken down some time after McMaster’s decision to cut ties with CI. However, the stipulation is still available in Spanish on the website. Prominent anthropologist and professor emeritus at the University of Chicago Marshall Sahlins noted McMaster’s decision to close its CI in an article written for the Nation, but pointed out that the university did so only after Zhao made a complaint and presented the case before a human rights tribunal. Epoch Times asked Canadian organizations hosting CIs whether they had concerns about hiring practices in light of the developments at McMaster and Hanban’s requirements for instructors. Luigi Benedicenti, associate vice president academic at the University of Regina, says the university enjoys a “very productive relationship” with its CI, and ensures it enforces its own hiring policies, which are free of discrimination. However, instructors such as Zhao, dubbed “volunteer teachers” by the CI, are required to sign a contract with Hanban before leaving China. Although the term “volunteer” is used, the instructors are provided with a living allowance while in Canada. Zhao’s Canadian work permit named McMaster as her employer. Benedicenti says he can’t comment on any contract other than the University’s own contract. Charles Beaupré, assistant professor of Chinese modern languages and classics and co-director of the Confucius Institute at St. Mary’s University, makes a similar argument. “The hiring process occurred within China itself, and so if these, let’s say trainees [volunteer teachers] that come out of that structure or training programs are sent to Canada or anywhere else in the world, we still have to understand that this was occurring within China, China’s jurisdiction, and they are essentially accountable for working with them in that context,” says Beaupré. Karen Falconer, executive superintendent for continuing and international education at the Toronto District School Board, says she expects the district’s staff will ensure all of their own policies are enforced. “There is every expectation that our director of the Confucius Institute will ensure that all of our policies are complied with,” said Falconer, while noting that details of the board’s relationship with the CI are still being worked out. No further details were provided on how the board will oversee contracts signed in China. Among the organizations hosting CIs approached by Epoch Times, the University of Waterloo, the New Brunswick Department of Education, and the Edmonton Public School Board did not respond to requests for comments. Brock University and the Coquitlam School District refused to comment on the issue. The University of Sherbrooke (which hosts its CI in partnership with Dawson College) said it does not grant media interviews on its CI. The University of Saskatchewan said no one was available to comment on the issue. In an emailed statement, the British Columbia Institute of Technology (BCIT) said that “BCIT employees are hired as per BCIT policy and procedures,” but rejected requests for an interview or clarification on how the issue regarding contracts signed in China with Hanban is dealt with. Seneca College said in an email that its CI instructors are staff employees of its partner institution in China, the Northeast Normal University. The college did not respond to requests for an interview. John Osborne, Carleton University’s dean of the faculty of arts and social sciences, which oversees the university’s CI, says the restriction on hiring doesn’t apply to Carlton as it has a different arrangement. “It’s a very different system, where we’re exchanging faculty essentially, so they’re not signing a contract with us, but we have an exchange agreement with Central China Normal University,” he says. Joel Chipkar, a spokesperson for the Falun Dafa Association of Canada, says all institutions in Canada hosting CIs should follow McMaster’s lead and shut them down. “We were pleased with McMaster’s decision to uphold their anti-discrimination policy on this particular issue regarding CI’s discrimination against Falun Gong. It shows that the issue is clear, present, and real,” Chipkar says. While holding these positions, Li was in attendance at the opening ceremony of the CI at Carleton University in 2012. According to a report by the Xinhua news agency, the Chinese regime’s mouthpiece, during the ceremony, CI students recited the poem “Snow” by Mao Zedong. Mao once told his English secretary that the poem is anti-feudalistic as it criticizes China’s ancient emperors. During the Cultural Revolution, Mao launched an anti-Confucius campaign to destroy the “feudal thinking” that is associated with the teachings of Confucius, the namesake of the Confucius Institutes that the CCP promotes so widely today. Terry Russell, associate professor at the department of Asian studies at the University of Manitoba, says the fact that Li attended the opening ceremony signals the importance of CIs to the CCP’s propaganda agenda. “It just reinforces what seems pretty obvious from all other indicators: [Confucius Institute] is a major propaganda on the part of the Chinese government, it’s a way that the Chinese government is trying to soften up their potential market,” Russell says. Russell says the regime uses CIs to present only their side of various issues. “By allowing the Chinese government basically free tickets to convey their interpretation of Chinese culture, Chinese language and whatnot, it means that Canadian students are getting a very, very different kind of understanding of what China means, what values, democratic values, etc. might mean in the context of China,” says Russell, who campaigned to prevent having a CI at the University of Manitoba. St. Mary University’s Beaupré says that the CI at his university does not get involved in politics. “We have this mandate essentially just to work with what is non-political in terms of language, more benign aspects of the culture, and then try to promote a little more this type of relationships in terms of economic activity or even trying to promote exchanges in terms of health and wellness,” he says. But that’s not always the case in CI classes. In 2008, when Chinese paramilitary troops were sent to quash Tibetan protests, a University of Waterloo CI instructor rallied her students to condemn “anti-China” reports in the Western press, leading one Canadian television network to apologize for its reports. The same year, the Tel Aviv University shut down a student-led art exhibition depicting the oppression of Falun Gong in China out of fear of losing its CI and other perks supported by the Chinese regime. An Israeli judge later ruled that the university had violated the students’ freedom of expression. He says the CI is hosted at the university not to teach politics, but to teach language. “If there have been instances of that [politics], no-one has brought it to my attention, so I’m not aware of it,” he says. According to a document obtained by Epoch Times, CI staff at Carleton organized a session for local Chinese teachers in early 2013 covering different topics, with a focus on current social topics in Chinese social media. One of the topics was a discussion on the 18th Chinese Communist Party Congress, including “socialist constitution, Chinese dream, abolishing labour camps, the new anti-corruptions measures,” among others. After checking with CI directors at his university, Osborne says he is not concerned about this activity. “I am satisfied that this does not represent an attempt to indoctrinate Carleton students,” he says. Osborne says the university’s contract with its CI is for two years, and it can only be renewed by mutual agreement. “If we didn’t think it was working, we wouldn’t renew. But so far it seems to have been working quite well. No complaints thus far, and not a single student has come forward with any complaints,” he says. Russell says universities shouldn’t be expecting undergraduate students to raise concerns. “They’re being taught by people who apparently know a whole lot about a given subject, so the students would be reluctant to question, or really wouldn’t have the basis to question what they’re being taught,” he says. That’s how Zhao, the former CI instructor at McMaster, was trained by Hanban to handle questions about topics deemed sensitive by the Chinese regime, such as Taiwan and Tibet. The instructors are told to first try to avoid answering questions on sensitive issues, and if not successful, to present the Chinese regime’s version of the issues. Russell notes that the CI website lists Taiwan as the largest island in China, denying the de facto independence of the country. “Students would obviously have a problem with figuring out exactly what’s going on there, but they would assume that certainly what they’re being told by the teacher is that Taiwan should be part of China,” he says.